Twilight of the Elites: Chris Hayes on How the Powerful Rig the System, from Penn State to Wall St. | Democracy Now! Twilight of the Elites: Chris Hayes on How the Powerful Rig the System, from Penn State to Wall St.
host of Up with Chris Hayes on MSNBC and editor-at-large of The Nation. His new book is Twilight of the Elites: America After Meritocracy. AMY GOODMAN: A scathing new U.S. Senate report faults the global bank HSBC for money laundering. The 335-page report released Monday said a “pervasively polluted” culture at HSBC allowed the bank to act as financier to clients seeking to route shadowy funds from across the world. Clients included drug cartels in Mexico, banks in Saudi Arabia with ties to al-Qaeda, Iranians who wanted to circumvent U.S. sanctions. The report on HSBC is the latest in a series of recent scandals that have rocked the global banking system. The British bank Barclays recently admitted its traders tried to manipulate a crucial global interest rate. Meanwhile, JPMorgan Chase has disclosed it lost nearly $6 billion in risky bets—far more than originally projected. Well, we’re spending the rest of the hour today with the author of a new book that examines how Wall Street and other major institutions, from Congress to the Catholic Church to Major League Baseball, have been crippled by corruption and incompetence. The book is called Twilight of the Elites: America After Meritocracy. It’s written by Chris Hayes. Chris is host of the TV show Up with Chris Hayes on MSNBC and editor-at-large of The Nation magazine. Chris, welcome to Democracy Now! CHRIS HAYES: It’s such a great pleasure to be here. AMY GOODMAN: It’s a really interesting book. What do you mean by “Twilight of the Elites” and meritocracy? Twilight of the Elites means that what we have seen in this last decade is this cascade, almost uninterrupted cascade, of institutional failure and, specifically, elite failure. And I think what it—what the system is telling us, what these failures are telling us, is that the current social model and the current mechanisms of elite formation, the extreme levels of inequality we have, are producing an elite that cannot but help but fail, that one of the most insidious aspects of the current distribution of resources in this country and the current inequality we have isn’t just that it’s bad for people on the bottom of the social pyramid but that it makes people at the top worse. It conditions them to be incompetent and corrupt. And so, I think that’s one of the main arguments of the book, is that what we’re seeing in elite failure is produced by the system that produces those elites. AMY GOODMAN: So, you go across the board. You look at climate change. You look at the Catholic Church. You look at Penn State. I’d like to start there, even though we went through the whole list of the banks. AMY GOODMAN: The scandal of Jerry Sandusky. Now, last week, an exhaustive independent probe concluded top officials at Penn State University, including legendary football coach Joe Paterno, covered up sexual molestation allegations against assistant coach Jerry Sandusky 14 years before they finally came to light. The report concludes that a, quote, “culture of reverence for the football program” at the school led to the cover-up that, quote, “failed to protect against a child sexual predator harming children for over a decade.” Sandusky was finally arrested last year, found guilty of sexually abusing 10 young boys last month. Former FBI director Louis Freeh unveiled his findings Thursday. LOUIS FREEH: Our most saddening and sobering finding is the total disregard for the safety and welfare of Sandusky’s child victims by the most senior leaders at Penn State. Misters Spanier, Schultz, Paterno and Curley also failed to alert the board of trustees about the 1998 investigation or take any other action against Mr. Sandusky. None of them ever spoke to Sandusky about his conduct. In short, nothing was done, and Sandusky was allowed to continue with impunity. AMY GOODMAN: That was former FBI director Freeh, who headed up this investigation of Penn State. Chris Hayes? AMY GOODMAN: You grew up in the Catholic Church. CHRIS HAYES: And I grew up in the Catholic Church. My father was a Jesuit seminarian. To see it in this other context, in which you don’t have priestly celibacy, you don’t have the theology, and yet the behavior looks very similar, the uniting theme of these two institutional failures—and the uniting theme, in some ways, of the institutional failures of the decade—is this kind of elite self-protection, the social distance between the people who are at the top and the people who their decisions affect. So there’s this—there’s this moment in the book that I—that comes from some reporting in the New York Times that I recount, in which a victim of priest abuse in Belgium, his uncle happens to be the bishop, and he is sitting in the room with his uncle who’s the bishop and the priest who abused him, in which his uncle, the bishop, is prevailing upon him not to press charges on his abuser, because the abuser is about to retire. “And shouldn’t you just—let’s just sweep all this under the rug.” And the abuse victim says to his—to the bishop, “Why do you feel sorry for him and not me?” And that, to me, is the moral core of the transgression here, right? It is, the social distance had grown up to be so massive—in some ways, it was baked into the cake in the church hierarchy—between the bishops and the priests, who they considered their club, and the parishioners. And what we see in Penn State is an identical situation. The coaches and the athletic director and the hierarchy of the university are on the inside and are all looking out for each other, as opposed to looking out for the people that they have a duty to look out for, which are the children who are coming into contact, sometimes being abused on the property of Penn State. It’s that kind of elite self-protection that produces crisis and corruption and scandal. AMY GOODMAN: In your book, you mention the Academy Award-winning director Charles Ferguson and his documentary Inside Job. I want to turn to a clip that you quote in your book. In this clip, Ferguson confronts the former Federal Reserve governor Frederic Mishkin, who served on the Fed committee charged with oversight of consumer abuses. Ferguson asked Mishkin why he didn’t heed the warnings of Robert Gnaizda of the Greenlining Institute, who had alerted Mishkin to what was going on. CHARLES FERGUSON: He warned, in an extremely explicit manner, about what was going on. And he came to the Federal Reserve Board with loan documentation of the kind of loans that were frequently being made, and he was listened to politely, and nothing was done. FREDERIC MISHKIN: Yeah. So, again, I don’t know the details, in terms of—in fact, I just don’t—whatever information you provide, I’m not sure exactly—it’s actually—to be honest with you, I can’t remember this kind of discussion, but certainly, there were issues that were coming up. AMY GOODMAN: That’s former Federal Reserve governor Frederic Mishkin. Chris? CHRIS HAYES: It’s such a perfect example, again, of this concept of social distance, right? I mean, the people like Robert Gnaizda and the folks at the Center for Responsible Lending down in North Carolina that were working among communities that were on the wrong end of the subprime crisis, right, that were seeing their homes foreclosed on, that were seeing equity stripped out, that were seeing these serial refinancing with fees and fees and fees—the folks working there started ringing the alarm bells in 2002, 2003, publishing reports saying, “We’re going have 10 million foreclosures. This is going to be a total disastrous thing.” And they were meeting with the Federal Reserve, and they were waving charts in their faces, right? They were giving them data. And the Federal Reserve didn’t act. So the question is, why didn’t the Federal Reserve act? And there’s a whole bunch of complicated reasons. But I think, partly, at the core of it, is that they, the folks in the Federal Reserve—Frederic Mishkin; Ben Bernanke, who was a Fed governor, who was saying, “Don’t worry about subprime,” more or less; Alan Greenspan, the Fed chair—were just completely removed from the world in which subprime finance was metastasizing and wreaking havoc. And that removal allowed them to sort of go along doing what they were doing, doing the things that they thought were ideologically justified or justified by the data. When they didn’t—they were not embedded in that world. And the thought experiment I have in the book is, if Ben Bernanke or Alan Greenspan were in a neighborhood where this was happening, if they were walking down their street every morning and seeing the foreclosures signs, if they had a neighbor who had been through one of these serial refinancing and had all the equity stripped out and now faced foreclosure, I can’t help but think the Fed would have cracked down much earlier and with much more vigor. AMY GOODMAN: JPMorgan Chase, Jamie Dimon, you can give all sorts of psychological and philosophical reasons, but he walks into—before the Senate Banking Committee, and the guys on the committee, Republican and Democrat alike, have gotten millions of dollars from his bank and from him. I mean, you have Senator Schumer here in New York, right? Got something like $5-point-something million. And they—at a point when the public is thinking he is going to be grilled about what happened to his bank, how they lost so much money, they are asking him for advice. CHRIS HAYES: Yeah, tremendously solicitous. And I think, interestingly enough, it’s interesting to counter that to the hearings over Barcays before Parliament, which were much more rigorous and much more aggressive. And obviously the systems of campaign financing are quite different, which is not to say British politics doesn’t have its own problem with capture by banking interests. Part of the problem is that this kind of elite solidarity, this self-protection impulse, it stretches across the public and private sector, and it stretches across, in some ways, ideological lines. People are going to move on from being senators to go work at big corporate law firms in Washington, D.C., or lobbying firms that are going to represent those same interests. AMY GOODMAN: Or, if they want to keep on being senators, they have to appeal to these same interests. CHRIS HAYES: Exactly. But I think, in some ways, it’s even more—you know, it’s funny. I think—there’s an argument, I think, that we—when we think about how money in finance—money in politics works is this just basic dependency, right? “I want to keep raising money, because I want to keep being a senator. The source of the money are folks like you. I don’t want to tick you off.” And I think that’s true. But there’s also just a cultural affinity. I mean, what happens when you spend all your time talking to people who are in the 1 percent, which is essentially a job requirement to be a member of the American Congress, because you have to raise enough money, such that you spend all your time talking to these people, and you have conversations and say, you know, “I’m really frustrated with, you know, this regulation, and I think taxes on X, Y and Z are too high” — what ends up happening is that your worldview, your kind of—the perspective that you occupy yourself gets very distorted. AMY GOODMAN: The Obama administration has defended its failure to prosecute any senior financial executives by saying their behavior wasn’t actually illegal. This is President Obama speaking at a White House news conference last October. PRESIDENT BARACK OBAMA: Well, first, on the issue of—on the issue of prosecutions on Wall Street, one of the biggest problems about the collapse of Lehman’s and the subsequent financial crisis and the whole subprime lending fiasco is that a lot of that stuff wasn’t necessarily illegal, it was just immoral or inappropriate or reckless. That’s exactly why we needed to pass Dodd-Frank, to prohibit some of these practices. You know, the financial sector is very creative, and they are always looking for ways to make money. That’s their job. And if there are loopholes and rules that can be bent and arbitrage to be had, they will take advantage of it. So, you know, without commenting on particular prosecutions—obviously, that’s not my job, that’s the attorney general’s job—you know, I think part of people’s frustrations, part of my frustration was a lot of practices that should not have been allowed weren’t necessarily against the law, but they had a huge destructive impact. AMY GOODMAN: —have turned against him now. CHRIS HAYES: Yeah, I mean, I don’t think that—from all the reporting I’ve done and the reading I’ve done and the research I’ve done, I don’t think that his account of the crisis stands up, because I think he’s right that a lot of what did happen was perfectly legal and also incredibly reckless and destructive, but, in tandem, there was, it appears—just every time you go through and look at emails that were being sent, any time something surfaces a little bit, you see the kind of tip of the iceberg of fraud and deceit that was lying underneath the entire thing. And the Libor scandal is a perfect example. We’re just hearing about this now, about this systematic rigging of rates that was happening. And we think now it wasn’t just Barclays—there’s an implication that we know about Barclays because they cooperated with the investigation—that the other banks were doing it, too. Something as routine as that, it’s hard to think, well, it was just cordoned off with the way that they were dealing with the Libor. No. I mean, I think it’s a natural thing to think that this was much more widespread. And the widespreadness of it and the fact that there hasn’t been criminal accountability makes efforts to pass regulatory reform—and, in fact, they have passed regulatory reform—much weaker, because accountability really matters. And accountability is something that doesn’t just come from regulation; it does come from the force of criminal law, as well. It comes from seeing your livelihood and life at stake in making decisions or in nurturing a culture in which decisions are made that are counter to the law. And I don’t think that—I think the absence of that accountability defeats much of the intent of regulatory reform. You have to have those two things together. CEOs, particularly, top bankers, people at trading desks, who are overseeing billions and billions of dollars, have to genuinely be worried that if they do something wrong, they will be held to account by the law. And right now, I think, if you look at the way the emails work, if look at the casualness with which the traders at Barclays are, in writing, rigging a rate and saying, “Thanks, bro. Good looking out. Let’s get a bottle of champagne,” these are not people that are afraid of accountability. I mean, you do not put that in an email if you’re afraid of accountability. If that’s the culture in finance—and I believe it is the culture in finance—in which there is no fear of reprisal, then you are going to get systematic wrongdoing. AMY GOODMAN: We’re talking to Chris Hayes, host of Up with Chris Hayes on MSNBC every Saturday and Sunday morning at 8:00 for two hours. His new book is called Twilight of the Elites: America After Meritocracy. And we’ll continue with him after break. 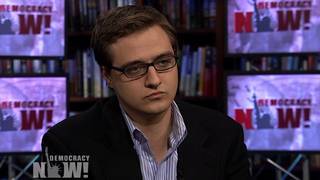 AMY GOODMAN: Our guest is Chris Hayes, host of Up with Chris Hayes on MSNBC and editor-at-large at The Nation. His new book is called Twilight of the Elites: America After Meritocracy. People have been tweeting in questions, have been emailing in questions, have been facebooking us. This is Bob Vella of Longview, Washington, who emailed this question. He asks, “Trust in America’s institutions is falling at an alarming rate, and for good reason. Just about everywhere we look, there is abuse of power and corruption. The public’s reaction has generally been apathetic and insensitive, primarily because most people feel powerless to affect any positive change. Is the news media complicit in this lack of national moral outrage due to its corporate practice of not upsetting the establishment?” Chris Hayes? CHRIS HAYES: I think it is partly complicit, but I also think there’s a lot of distrust in the media itself. And when you have distrust in the mechanisms by which you even get information, it’s hard to stoke outrage, because people discount information that they hear. So, you know, there are a lot of folks who just don’t believe what, you know, might be reported on Democracy Now!, might even be reported in the New York Times, which is an establishment publication, because they’ve been told by the people they do trust—Glenn Beck or Rush Limbaugh—that those are completely untrustworthy sources. Part of the—part of the issue we have right now is that—and I’m going to sound a little bit like a nostalgic or a conservative here, but there is no common table that the American people come to. There just isn’t, for better or for worse. And I think there’s great things about that, about the death of the kind of broadcast era, and there’s troublesome things about that. But the fact is, the conversation that we have about public life, even the facts that we have at our disposal, the things that we learn day to day, there is no common table that we receive them from. We all get them from different places, increasingly balkanized. And that means, even when there is outrage, that outrage is specific in its targets and diffuse in different ways and in sometimes intention across these ideological lines. He goes on to write, “[T]oday’s elite lacks the self-conscious leadership ethos [that] the racist, sexist and anti-Semitic old boys’ network did possess.” Your response, Chris Hayes? CHRIS HAYES: Well, there’s a whole variety of things in that. I mean, in terms of his assertion that they don’t get there because—they get there because of being hard-working and disciplined, as opposed to being corrupt, I mean, you can be both. In fact, there’s a lot of hard-working, disciplined, totally corrupt folks on Wall Street, for instance, and I don’t think we have to choose between the two. And, you know, I make a book-length argument to support my contention, so I can’t, you know, refute it here. AMY GOODMAN: And longer might not be harder. AMY GOODMAN: And getting from one job to another to another. CHRIS HAYES: Exactly. And, you know, that self-justifying story that he tells is precisely part of the problem, because that’s the self-justifying story that’s the heart of the problem of the way we think of meritocracy, which is the people at the top have gotten there because they deserve it. CHRIS HAYES: The record highs. AMY GOODMAN: —the incredible heat wave this country is experiencing—how does that fit in with the elites? CHRIS HAYES: So, it fits in in this way. I mean, my big concern—I think climate change is the biggest problem. It’s the biggest challenge we face. And it’s also a place where our inaction is the most dramatic, in some senses. People barely even give it lip service in the conversation in Washington, D.C., anymore. I mean, it’s just essentially evaporated from the conversation. The problem with climate change that’s distinct in some ways is that it requires a certain level of mediation to take seriously. If you live in Youngstown, Ohio, which has a massively high unemployment rate, you don’t need anyone to tell you that unemployment is a problem in Youngstown, Ohio, because you see the empty stores, you see the people out of work, you know them, you are them, they’re in your family. If you’re in a neighborhood that has incredibly high crime rates, you don’t need anyone to tell you that high crime is a problem. You, yourself, have been victim. People you know have been victim. Climate works in a different way. We are not, as human beings, equipped to just perceive what is essentially an imperceptible gradual rise in global average temperature. AMY GOODMAN: But people are experiencing extreme weather. AMY GOODMAN: —also flash the words “climate change,” we would know pretty darn fast, like the rest of the world. CHRIS HAYES: That’s right. But that’s—again, that’s a mediation question, right? We need people to be putting the dots together, right, to say this is part of it. Now, I think that when you have this distrust—when you have distrust of science, for instance—when you have distrust of elites in general, it’s a harder case to make. What I think is happening now for the first time—and Bill McKibben made this point on my show, and I thought it was kind of an interesting one, which is, look, the weather—the wolf is at the door. The weather is freaking out. We no longer have to worry about mediation or even persuading people. It’s real. He basically has this perspective, which I’ve become more and more persuaded by, which is that the climate disaster, as it unfolds before us, is going to do the convincing that 10 or 15 years of the press or, you know, scientists have failed to do. AMY GOODMAN: —I also spoke to Marc Morano, who is publisher of Climate Depot, a website run by the climate-denier group, Committee for a Constructive Tomorrow. I asked him about President Obama’s record on climate change. MARC MORANO: His nickname is “George W. Obama.” Obama’s negotiator, Todd Stern, will be here today. They have kept the exact same principles and negotiating stance as President George Bush did for eight years. Obama has carried on Bush’s legacy. So, as skeptics, we tip our hat to President Obama in helping crush and continue to defeat the United Nations process. Obama has been a great friend of global warming skeptics at these conferences. Obama has problems, you know, for us, because he’s going through the EPA regulatory process, which is a grave threat. But in terms of this, President Obama could not have turned out better when it came to his lack of interest in the congressional climate bill and his lack of interest in the United Nations Kyoto Protocol. So, a job well done for President Obama. CHRIS HAYES: Having—yeah, of course. AMY GOODMAN: —pouring millions into these groups and ads in the media. CHRIS HAYES: Yeah. For all of those reasons, we’re not doing the one thing that we need to be doing on the international stage, which is boldly, boldly leading. AMY GOODMAN: So, finally, Chris, what does America after meritocracy look like? CHRIS HAYES: You know, I think that we can have—if you look at American history from the progressive perspective in a positive way, over the—say, from the New Deal to now, I think there’s, in some ways, two eras of equality, that had different kinds of equality developed. There was unparalleled—and unrepeated since—economic equality, income equality, wealth inequality, from basically the New Deal to the 1970s. And that’s now gone by the boards. But that same period of time had a tremendous amount inequality along lines of race and gender and sexual orientation, which wasn’t even a political issue, largely, at the time. Since 1972 or 1973 to the present, we’ve seen tremendous strides made in gender equity, although still a long way to go; strides made in racial equity, although still a huge way to go; huge strides made in the equality of people along lines of sexual orientation. But we’ve seen that wealth and income equality evaporate. So I think that we need a third era of the equality that combines those two, and I think that that’s not an impossible task. I think we can have a society that is dynamic, that is free, that is prosperous, but also that has much greater levels of equality, much lower levels of inequality and extremes between the rich and the poor, between the rich and everybody else, and also values equality along all these other lines of identity. AMY GOODMAN: And that will be achieved how? CHRIS HAYES: Politics and movements. I mean, pressure from below. And that’s the case in what happened—the New Deal was created by a series of social movements that restrained the plutocrats and the crisis, actually, and the way the plutocrats were discredited by the crisis, which I think we discount now as we think about it. And the same thing happened in the amazing liberatory movements, the 1950s, '60s and ’70s, towards equality along the lines of race, gender and sexual orientation. That's the only way we make progress. AMY GOODMAN: Chris Hayes, I want to thank you for being with us, and we’re going to post the second part of this conversation at democracynow.org. Twilight of the Elites: America After Meritocracy is his book. He is editor-at-large at The Nation magazine, and he’s got a new show—not so new, but it’s a great show—on MSNBC Saturday and Sunday mornings, 8:00 to 10:00. It’s called Up with Chris Hayes.